This morning I found out it was International Cat Day when Edward Lifegem announced that he was going to have an event to celebrate in Wizard101. I talked to him and he said he thought it would be cool if I had an event in Pirate101 as well, after his ended. I thought this was a great idea, even though it was last minute. First I went to Edward's event. 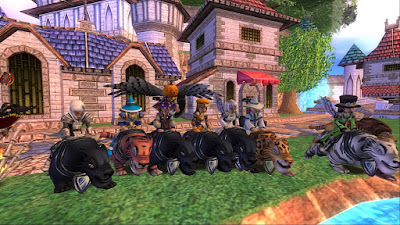 A bunch of us got together on our various cat/panther/tiger mounts and ended up having a mini "Cat Run" around the commons. Unfortunately I was having a really bad issue with lag, so I didn't get to run, but I did get to meet some new people, which is always fun! After that a few of us jumped into Pirate101 and had a dance party to celebrate. Of course we gathered in Catbeard realm, since it was a Cat Day celebration. Everyone had cat pets, companions (Catbeard FTW! ), or mounts equipped. 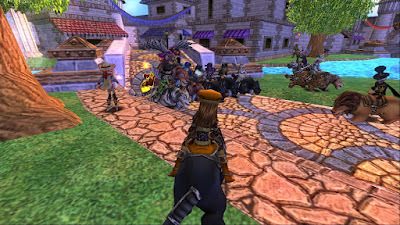 It was a smaller gathering than the event in Wizard101, but still fun!